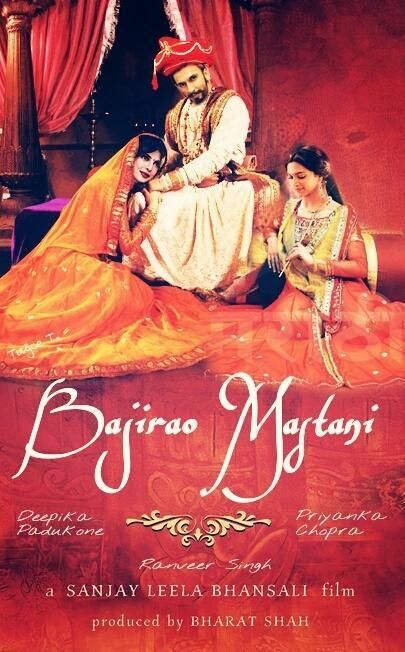 Bajirao Mastani first look is out and Bajirao Mastani is a 1800 historical romance with love story film. The film directed by Sanjay Leela Bhansali. The film based plot is Peshwa of the Maratha Empir last king Bajirao and his second wife life story. The movie casts Ranveer Singh as Bajirao alongside Deepika Padukone and Priyanka Chopra in lead role in the film. Sanjay Leela upcoming movie Bhansali Mastanin shooting already started in Rajasthan and Ranveer Singh was injured in the set and he is new look in the Bajirao Mastani first look poster. Deepika Padukone as Mastani the second wife of Baji Rao (Ranveer) and Kashibai (Priyanka Chopra) is first wife of Baji Rao. The movie was shooting in Madhya Pradesh Rajasthan Wai and Gujarat. The Bajirao Mastani will release on 25th December, 2015.
after success of love story Ram Leela, Ranveer Singh and Deepika Padukone is back in Bajirao Mastani. Priyanka Chopra already working with Ranveer Singh in Gunday movie and Priyanka Chopra was beautiful dance a item song Ram Chahe Leela with Ranveer Singh’s Ram Leela movie.